Delegation of the Ismaili Imamat | Ismaili.NET - Heritage F.I.E.L.D. Officially opened in December 2008 by His Highness the Aga Khan and Prime Minister Stephen Harper, the Delegation of the Ismaili Imamat is Ottawa’s newest architectural jewel. Built by distinguished Japanese architect Fumihiko Maki, this secular building is an impressive addition to the capital’s ceremonial route. The Delegation serves as the headquarters of Aga Khan Foundation Canada, a non-profit agency that supports social development projects in Asia and Africa. Professor Maki has translated concepts rooted in Islamic tradition into a bold, modern design, inspired by the natural luminosity and multi-faceted shape of rock crystal. Through the Delegation, the play of light on transparent and translucent surfaces creates a dynamic visual effect. Of special interest: an asymmetrical glass crystalline dome shaded with an inner layer of woven glass fibre; crystallized glass panels on the exterior of the building; an exterior courtyard; Canadian maple throughout the building; and an exterior podium made of Indus black granite. 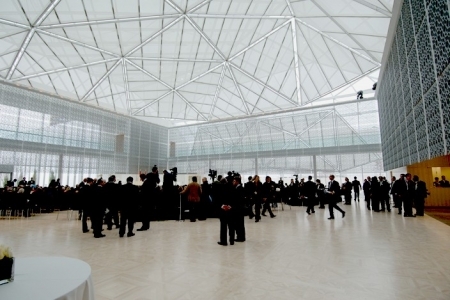 Maki and Associates has completed the first building in the world specifically designed for the Aga Khan and his agencies. The new, 95,000-square-foot building, known as the Delegation of the Ismaili Imamat, is located in Ottawa, Canada, and houses offices for the Aga Khan Foundation of Canada and Aga Khan Development Network. Ottawa, Canada: The Delegation of the Ismaili Imamat building, situated at 199 Sussex Drive in Ottawa, was officially inaugurated in the presence of Prime Minister Harper on Saturday, December 6, 2008. A secular facility, the Delegation of the Ismaili Imamat will serve a representational role for the activities of the Imamat including its development agencies which constitute the Aga Khan Development Network (AKDN).